It was summer of the year 1765. As usual the market squares of Stockholm were teeming with stout women selling beets and turnips, roses and gilly-flowers; as usual the urchins along the highways dangled straws of wild strawberries strung by their rosy little fingers. As usual small boats around the docks plied toward the archipelago carrying happy families to their summer homes. And in Assessor Swedenborg's home preparations were on foot for another departure, his ninth journey to foreign parts. Karl harnessed the horses and piled the carriage with provisions, for his master was leaving for Gothenburg, whence he would sail for Holland. Swedenborg had finished The Apocalypse Revealed and was ready to have it printed in Amsterdam. More than any of his previous works, this was the fulfillment of his mission, for it referred specifically to the establishment of that New Church and that Kingdom of God which had been his goal through all his labors, a goal dimly seen in The Economy, splendidly envisioned in The Worship and Love of God and laboriously treated in the theological works. Not until the judgment was accomplished, he had said, not until light from heaven could flow down into the minds of men, could this New Church begin to be established. The venerable sage was now actually to see the first acceptance of his doctrines by men on earth. In Gothenburg, while waiting for his boat to sail in a few days, Swedenborg was invited to dine at the house of one of the chief literary lights of the town, Dr. Johan Rosen, a poet and the editor of The Gothenburg Magazine. Among the company of friends gathered at Rosen's house was Dr. Gabriel Andersson Beyer who, like the host himself, was a teacher in the gymnasium or parochial college. [The gymnasium was a classical preparatory school under the jurisdiction of the diocese.] 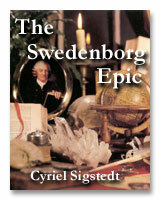 Dr. Beyer knew of Swedenborg from hearsay but had never before met the famous author. He was not entirely unfamiliar with his books, however, having begun to read one of the theological works. After reading halfway through it, however, he had found it incomprehensible and of very little value as theology. Beyer had heard it said that Swedenborg was somehow deranged on account of his assertion that he held communication with the spirits of the dead. When, therefore, at Dr. Rosen's dinner, he heard Swedenborg conversing quite sanely, and without the least indication of any infirmity or confusion of thought, he was very much astonished. Questioned about his remarkable mission, the assessor replied, simply and naturally, that the Lord had appeared to him and given him his commission (See p. 199). Dr. Beyer invited Swedenborg to dine with him the next day, in the company of Dr. Rosen, so that they might hear more about these strange claims. Accordingly, on the following day, after the gentlemen had dined, Dr. Beyer asked Swedenborg to give them a full account of his doctrines. Greatly animated by this request Swedenborg spoke on the subject so clearly and convincingly that Dr. Beyer and his friend were amazed. They did not interrupt him but when the discourse was at an end Dr. Beyer requested that on the morrow - when they were again to meet at the home of Councillor Wenngren - Swedenborg should present him with a written statement of his doctrinal position, so that Beyer might give it more attentive consideration. This he gladly promised to do. "My friend, from this day the Lord has introduced you into the society of angels, and you are now surrounded by them." Swedenborg took his leave shortly afterward as he was embarking the next day for Holland. Those present had been deeply affected. From that day on a great change took place in Doctor Beyer, an amiable and pious man who also was a learned Greek scholar. He resumed his reading of the volume which had formerly seemed "uninteresting and incomprehensible" and found, with his awakened interest, that it was of profound importance to humanity. He became convinced of the need for a systematic study of Swedenborg's writings, a study which continued uninterruptedly for the remainder of his life. He secured copies of all the published works and carried on a correspondence with the author which led to many valuable elucidations by Swedenborg of seemingly obscure doctrinal points. The printing of The Apocalypse Revealed seems to have commenced immediately after Swedenborg's arrival in Amsterdam. On the first of October he sent Beyer two copies of the material so far printed, promising him the remainder in the spring. On April 8, 1766 he sent Dr. Beyer eight copies of the finished work asking him to distribute them. One copy is for yourself, one for the bishop, one for the dean, one for Dr. Rosen, one for Burgomaster Petterson, one for the library; the two remaining copies you may lend out to your friends. At the conclusion of every chapter there are Memorable Relations separated from the text by asterisks, which you will please read first. From these a thorough knowledge may be gained of the wretched state into which the Reformed Churches have been brought by faith alone. I am now going from this place to England where some noise is probably being made on account of the English bishops being somewhat severely treated in the Memorable Relations; yet necessity required it. "Another wish I have besides - to see the subject of marriage fully treated which, among those who have delicate feelings, awakens embarrassing questions of conscience, and by the generality of men is not well understood, and -still less properly explained." This is particularly interesting in view of the fact that Swedenborg, at this very time, had already begun preparation for a work on the subject of marriage which was to be his next publication. In respect to the writings of Paul and the apostles, Swedenborg replied at length in a letter dated April 15, 1766. He had not quoted them in the Arcana because they are doctrinal writings, and consequently not written in the style of the Word, "which consists altogether of correspondences, wherefore it is effective of immediate communication with heaven." In doctrinal writings this communication is only mediate. Before leaving Amsterdam Swedenborg sent out a great many presentation copies of his latest work, The Apocalypse Revealed. Twenty were sent to France for distribution to cardinals, secretaries of state, royal societies, etc., and seventy copies to Sweden, ten of them as gifts to various senators and churchmen, including von Höpken and Nordencrantz. The remaining copies he intended to distribute among high ranking clergymen and Swedish libraries. Shortly after his arrival in London, in the spring of 1766, Swedenborg set about an errand that was entirely unrelated to theology. While in Amsterdam, he had reprinted his original Method of Finding the Longitude by means of the Moon, his youthful attempt to win the prize offered for the best solution of this most vexing maritime problem. He reprinted the pamphlet, he says, exactly as he found it written in his youth, "for since those days it has been enjoined on me to withdraw from this study and apply my mind to things more interior." At the end of the reprint, however, he appended a page of practical rules for simplifying his method. This method of computing ephemeredes by pairs of stars was already in use by seamen in several places and Swedenborg was sure that after the results had been gathered over a number of years the method would prove easy and useful. In England as well as in Sweden believers in the new doctrines were now beginning to appear, although there is no reason to suppose that Swedenborg met any of them during this trip. Stephen Penny, who will be remembered as the first affirmative reader of the new revelation, had interested an acquaintance of his, William Cookworthy, a distinguished member of the Society of Friends and the original founder of the British porcelain industry. Besides this there was an Anglican clergyman named Rev. Thomas Hartley and a London physician, Dr. Husband Messiter, about whom more will be said in subsequent chapters. Swedenborg had arrived in London about the end of March, 1766, and left at the end of August, a stay of five months. Ten weeks of this time, presumably the first, he lodged at the King's Arms Tavern in Wellclose Square, kept by a Swede, Erik Bergström. This section of the city was then a newly developed suburban area, settled largely by Scandinavians. A handsome Danish church stood there and a short distance away, on Prince's Square, was the Swedish church built in 1728 while Swedenborg's father was its absentee bishop. The pulpit was occupied by the Rev. Arvid Ferelius, and one of the pillars of the church was Swedenborg's intimate friend, the politician Christopher Springer, "a man of enviable reputation for virtue and intelligence," who highly appreciated Swedenborg's friendship. "I cannot assign a reason for his great regard for me who am not a man of letters," he says. "We were good friends in Sweden, to be sure, but that this friendship should have continued between us, with such constancy as it did, is what I did not expect." Bergström tells us that Swedenborg breakfasted on coffee and afterward used to take a walk, neatly dressed in velvet. He ate moderately at dinner and drank one or two glasses of wine after it, but never more. In the afternoon he took tea but never ate supper, and he usually retired early to his chamber. He was kind, generous, and always agreeable, but somewhat reserved. It would seem that after Swedenborg left the King's Arms he went to look for lodgings where he had previously stayed, at No. 4 Great Warner street in Cold Bath Fields next door to the Red Lion Inn. He found that his former landlady no longer lived there but the present mistress of the house gladly offered him the rooms. Swedenborg had few pretensions as far as his living quarters were concerned, but it seems that his angels were very particular on certain points. They could not be with him in this house. He told the lady that he was not able to stay there because there was no harmony in the home. This she acknowledged, presumably giving him the address of a friend where he secured lodgings. At a certain time, as I was wandering through the streets of a great city inquiring for lodgings, I entered a house inhabited by married partners of a different religion; I, being ignorant of this circumstance, the angels instantly accosted me, and said, "We cannot remain with you in that house; for the married partners who dwell there differ in religion." This they perceived from the internal disunion of their souls. We heard a noise and, not being able to tell the cause, we approached a door which had a little window looking into the room where Swedenborg was sleeping. We saw him with his hands raised toward heaven and his body apparently very much agitated. He spoke much for half an hour, but we could not understand what he was saying, except when he dropped his hands, when we heard him cry with a loud voice, "My God!" but could hear no more. He afterward remained very quietly in his bed. I stepped into the bedroom with the landlord, and asked him whether he was ill.
"No," said he, "but I have had a long discourse with the angels and the heavenly friends, and am at this time in a great perspiration." As his luggage had been taken on board, he asked the landlord for a fresh shirt and a fresh sheet. Afterward he went to bed again, and slept until morning. When the captain of the vessel called for Swedenborg, I took leave of him, and wished him a happy journey. I then asked the captain if he had a good supply of provisions on board and he answered me that he had as much as would be required. Thereupon Swedenborg observed, "My friend, we have not need of a great quantity, for this day week we shall, by the aid of God, enter the port of Stockholm at two o'clock." The trip to Stockholm coincided exactly with Swedenborg's amazing prediction. Captain Dixon told Christopher Springer on his return that he had never once dropped anchor till he got to Dalarö Island, where Swedenborg disembarked, to continue his journey by land. Never in his life had Captain Dixon experienced such a favorable wind, which followed him at every turn. It was the more amazing since previously the wind had been contrary. This and other instances of Swedenborg's bringing favorable weather with him gave rise to a saying among the seamen that he was a favored voyager. Another captain said of him, "If Swedenborg chooses he can always have a free passage with me for during the whole of my experience at sea I have never sailed better." Robsahm once questioned Swedenborg about these voyages, but got the reply that "he wondered himself at the remarkable good fortune he always had while traveling by sea; but that at the same time it was obvious to any intelligent man that he was not able to do miracles." The assessor was invited to dine at the home of the Swedish consul, Mr. Kryger, with other officials and prominent townspeople who wished to see the famous man. He was silent at table, a silence which no one thought fit to break. Finally the host made a reference to the late king, and asked Swedenborg whether, since he could see and speak with the dead, he had seen the king since his decease. Swedenborg replied in the affirmative. He said that when he saw him the first time, the king was accompanied by a bishop or prelate who humbly begged his pardon for the many errors into which he had led him by his counsels. A son of the deceased prelate was present at the table, and Mr. Kryger - fearing that Swedenborg might say something further disparaging about his guest's father - interrupted the assessor to explain, "This, Sir, is his son!" "It may be," Swedenborg replied, "but what I am saying is true." One of Swedenborg's first actions after his return home was to present his recently reprinted Method o f Finding the Longitude to the secretary of the Academy of Sciences, Pehr Wargentin. The Academy's membership had risen to 300 and their meetings were now held in the assembly room of the House of Nobles. A few years before, a resolution had been passed that members who were constantly absent and showed no interest in the sessions should be dropped from the rolls. The ruling seemed particularly applicable to Swedenborg, who made up his mind to put in an appearance, and on June 3, 1761 he read a short paper describing the process of Inlaying Marbles which he had learned during his sojourn in Holland, many years before. The choice of subject shows how far our philosopher had journeyed from the ranks of his learned colleagues. His speculations on the interiors of nature had failed to interest them, likewise his theories on anatomy; he knew they were not ready to follow his findings in either psychology or religion; so he gave them a paper on a practical subject on which there could be no dispute, which they subsequently printed in their "Proceedings." One feels a touch of pathos about this document, Swedenborg's only contribution to the Royal Academy in fourteen years. It is as if one who bears tidings of the utmost importance, which he longs with all his heart to share with a friend, is nevertheless only able to greet him with a handshake. Dear Sir, Yesterday old man Swedenborg came up to the Academy and handed in the memorial and publication here enclosed. His idea seems to be that a translation of it should be entered in the "Transactions." Even before he went abroad last time I told him my opinion on this matter, but he is obstinate. Although he has not read anything fresher than what Riccioli has written about the matter (Almagestum novum, 1651), and knows nothing whatsoever of what has been done on the subject during the last thirty years, he nevertheless thinks that his own method is the best and only possible one. Without having thought either of an improvement of the lunar theory, or of any instrument by means of which observations at sea could be made more easily and accurately, he nevertheless lays claim to the Longitude Prize. Still, one ought to try to convince him of his delusion. Kindly take the trouble, therefore, to put down a few critical remarks on the treatise to be shown to him. It is difficult to argue with a person who does not even understand the principles, but for that reason one need not go to the bottom of the matter, either, with such a one. One could expect something better from one who knows "arcana coelestia" and can ask the spirits about everything. Swedenborg also sent a copy of his Longitude to his nephew, Dr. Carl Jesper Benzelius, requesting him to give it to the professor of astronomy at the college in Linköping, Nils Schenmark, who afterward addressed a letter to Swedenborg stating his objections to the Method. To this Swedenborg in his reply said that as his thoughts have for a long time been estranged from this study, he is unable to enter into all the particulars of it, but nevertheless believes that it is practical. He said that when he first published the method, some fifty years ago, the necessary lunar tables were lacking, without which no sailors could have used it. "The principle of Swedenborg's method of longitude determination seems to be entirely correct. If the two stars are not in the same longitude, the method is still theoretically sound. But the fact that the moon may not be on the ecliptic will make a noticeable error in the solution." "Something new may occasionally flow into these explanations. Love for the truths of God's Word and its fructifying effect in lessening ignorance and contributing toward the rebuilding of a fallen Christianity is our unknown author's only object." Soon afterward the Household Sermons appeared with full approval of the Consistory, embellished with a beautiful vignette depicting a sunrise. The volume opens with a discussion of the first coming of the Lord and how the Jews were unable to see that Jesus was the awaited Messiah because they insisted on keeping merely to the letter of revelation. A prayer is added "that the Kingdom of God or of the Messiah may also come to us, and that we may not, like those in the text, see the King only with the eyes of the body, but may also see His coming in His Holy Word, through the doctrine which is made known to us from Him and follow Him with joyful hearts . . . "
"I have with pleasure perused your new essays on the Gospels," wrote Swedenborg. "Fine interpretations are given in respect to the first coming of the Lord." He then expounds the signification of the word "manger" and adds, "Here they now begin to think more of charity than before, asserting that faith and charity cannot be separated . . . "
In warning Dr. Beyer to be cautious, Swedenborg may have had in mind the experiences of Prelate Oetinger who had been summoned before the Council of Württemberg for trial because he had sponsored some of the new ideas. So, while Swedenborg was busy adding line upon line, his words were beginning to have an effect in various places. Striking was the effect of the new revelation on Bishop Halenius of Skara to whom Swedenborg had presented a copy of The Apocalypse Revealed. He was a man of extraordinary clearness of mind, a forcible speaker and writer, but known to be quite avaricious and often involved in partisan quarrels. Swedenborg's housekeeper relates that she was present when Bishop Halenius paid Swedenborg a visit. The conversation turned upon sermons and Swedenborg remarked to Halenius, "You spread falsity in yours." "There is already prepared for you a place in hell. But I predict that in a few months you will be attacked by a severe illness during which the Lord will seek to convert you. If then you will open your heart to His holy influences, your conversion will be accomplished. Write to me then and ask me for my theological writings, and I will send them to you." A few months later an official of the diocese of Skara called. "How is Bishop Halenius?" Swedenborg inquired. "He has been very ill," replied the official, "but he has now recovered and is quite a changed man. He is kind, benevolent, and full of goodness and he is returning threefold and sometimes fourfold what he' had previously acquired by unrighteous means." From that time to the hour of his death Bishop Halenius was one of the warmest supporters of the doctrines of the New Church and openly declared that the theological writings of Swedenborg were the most precious treasures of humanity. During the fall of 1767, we are told, a little girl and her two brothers were walking up Hornsgatan when they were overtaken by a sudden shower of rain and sought shelter by stepping into a covered way. Here an elderly gentleman came toward them and pleasantly invited them inside. The elder brother started to explain why they had stepped into the shelter. They were in Stockholm to attend their father's funeral, he said, and were on their way to dine at the house of one of their father's friends in South Stockholm. "That I know already," said the old gentleman; "for your father has just been with me and told me that you were coming." Swedenborg then asked the children to come into his room where he entertained them with conversation until the rain stopped and they were able to continue on their way. They were the children of Bishop Halenius.